EXTRA WIDE: Expands to stairways and openings between 29-38.5 inches wide. Stands 30 inches tall. EASY TO USE AND SET UP: Pressure mount design that is quick to set up. No tools required and is gentle on walls. ADJUSTABLE: Includes a 6-inch wide extension kit. Perfect for doorway, hallway and bottom of stair use. Gate can quickly be removed out of the opening for easy storage. With additional extensions at max the gate can accommodate a 60 inch opening. What’s Included in The Box One Regalo Easy Step Baby Gate Instruction Manual One 6-inch extension kit Four pressure mounted spindle rods Four wall cups The Regalo Easy Step Baby Gate is backed by a manufacturer’s limited 90-day warranty. This safety gate has been certified by the Juvenile Products Manufacturers Association (JPMA). It also meets the safety standards set by the American Society for Testing and Materials (ASTM). Providing a level of comfort for parents, the Regalo Easy Step Baby Gate is made of an all-steel construction to hold up to the wear and tear of a toddler. Designed with convenience in mind, the baby gate installs quickly. We’re talking in minutes. Take down is just as fast. Each of the four pressure mounts can be adjusted to create a stable and secure fit. Use the included wall cups if you’d prefer to attach it to the wall. 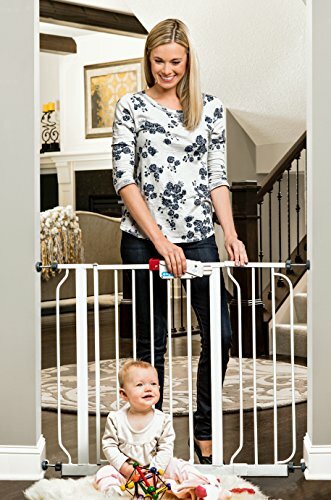 Standing 30” tall, the Easy Step Baby Gate is a perfect height to keep your little one safe and is easily expandable to fit larger openings. The expandable baby gate is versatile fitting doorways between 29”-34”. Add on the included 6” extension, and the easy step baby gate expands from 29” to 38.5”. Two more extensions kits (sold separately) can be added to accommodate wider spaces. These additional extensions are sold separately. In no event, regardless of cause, shall company be liable for any indirect, special, incidental, punitive or consequential damages of any kind, whether arising under breach of contract, tort (including negligence), strict liability or otherwise, and whether based on this agreement or otherwise, even if advised of the possibility of such damages. To step over a gate each time you need to pass through will become annoying fast. The walk-through design allows adults to walk through by simply sliding the safety lock back and lifting the lever handle and the 16” door opening provides enough space for you to walk through. When you need to take your safety gate down, the Regalo Easy Step Baby Gate is lightweight, portable and stows flat – making it easy to put in your closet before guests arrive or pack along on your next trip to grandma’s.